New bigger& better scans of the same comic uploaded 5 years ago. The front cover was missing a chunk from the bottom corner, so I've added a larger fc from Metropolis. Cover (1 page) Fury of the Golden Apes! Comic Story (10 pages) Fury of the Golden Apes! Synopsis: Gus Corrigan, seeking his lost brother, asks Kaänga to help him. Unknown to Corrigan, his brother has been captured by a gorilla cult and the leader of the cult has given him amnesia-inducing drugs and convinced him that he is the gorilla god Jebola, returned to his people. Kaänga locates the cultists and frees Corrigan's brother and turns the cult leader over to the district commissioner. Synopsis: Simba is challenged by Crekko for the kingship of the jungle. 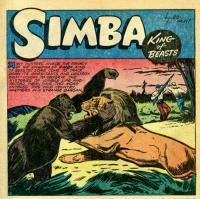 While they are fighting, a big game hunter spies them and fires his rifle, wounding Simba. Simba is taken captive by a wildlife photographer who wants to use footage of the lion in his new film. While Simba is captive, Crekko declares himself king of the jungle. 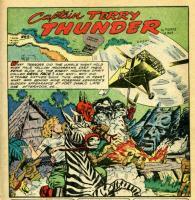 Simba escapes his captors and attacks and kills Crekko, an attack that is captured on film by the happy photographer. Synopsis: A pair of prospectors are dynamiting the river in Wambi's jungle. The animals gather to choose a plan for ridding themselves of the white men. Sirdah suggests that the animals attack en masse. Wambi objects, fearing his friends will be hurt, but he is overruled. As predicated the mass attack is repelled and some of the animals are wounded. 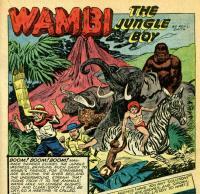 Wambi then has Beaky steal some of the prospectors' dynamite and drop it into the local volcano. The resulting eruption causes the prospectors to flee and the animals promise to heed Wambi in the futute. Synopsis: Trivia about several primate species. Synopsis: Terry and his helicopter are hi-jacked by mine owner Miss Carter who needs to get to the interior to find out why her native laborers have fled. On arrival they find that her former overseer and his partner have been using a local rock formation, the Devil Face, to intimidate the natives and to induce them to pay tribute. Terry exposes them and arrests them. Synopsis: Con men, using a trained elephant, persuade the Balaharis that their recently deceased chief's spirit has inhabited an elephant and wants them to pay tribute to the con men. Tabu arrives and exposes the plot and turns the con men over to the district commissioner. Synopsis: Trivia about several deer species. Synopsis: A gang of European criminals convince a possible financier of the worth of their gold-gathering plan by "seeding" temple ruins with gold-plated trinkets. Camilla exposes the plot and leaves the criminals to the mercies of the Ugandis, who are angered by the presence of white men in their territory.